In our monthly Zoom calls this year, we have been going through a list of the uses of participatory narrative inquiry. To support our discussions, I’ve been taking some time each month to think about the topic of the next call. I have no particular process in doing this; I just wait and see what rises to my mind. Then I develop the idea by writing about it, so we can talk about it (among other things) in our call. 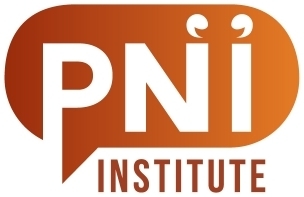 This time I thought about using PNI for dialogue (that is, to help people talk to each other across divides). When I talk with people about PNI and dialogue, I’ve noticed that people are often surprised when I advocate keeping people with different views apart and letting their stories mediate between them. Sometimes people whose approaches put “the whole system in the room” don’t like this idea. I can guess why they don’t like it; it seems fatalistic. It seems like I’m saying it is impossible to bring people together and help them find common ground. I’m not saying that, but I am saying that when it comes to sharing stories, an incremental approach is best — and I do mean “approach” literally, as in, helping people approach each other from a great distance. Approaching armies once sent messengers bearing flags to negotiate out-front terms of peace or battle. In the same way, our stories can negotiate with those we fear in ways we find acceptable, helping us to eventually coexist in a proximity that would be too dangerous to consider at first. There are three ways in which any one of us can help groups of people share stories. Each takes place at a particular distance. (close) Conversational contact: We can invite people into an open, unstructured conversation and wait for story sharing to arise, as it naturally does. (middle) Facilitated process: We can guide people through a process designed to promote and support story sharing in a carefully designed context. (far) Mediated exchange: We can convert told stories into documents and other artifacts that mediate between people and groups without putting them in direct contact. Which of these methods works best in any context depends on each group’s assessment of the other group’s identity (are they like me? ), safety (will they hurt me? ), normalcy (are they sane? are they reasonable? ), acceptability (are they good people? ), and familiarity (are they what I am used to?). I thought it might be helpful for our discussion to consider how these things might come together. I first tried considering the combinations individually (e.g., unstructured conversation with sane but unfamiliar people), but I soon found that I could lump all of the assessment evaluations together into one giant spectrum that runs from comfort to fear. This diagram shows my assessment, based on my reading and experience in projects, of what works in story sharing along that spectrum. The horizontal axis shows the spectrum from comfort to fear, and the vertical axis depicts the benefits and harms that can come from story sharing in those areas. In an established group, shared norms and constant negotiations usually keep story sharing from wandering into dangerous territory. It is true that story sharing can cause damage to a group, but so can it repair damage; so the balance tends to stay near the middle line. In this situation, conversational story sharing is usually comfortable and familiar — but it can become so comfortable and familiar that people stop using their stories to explore the edges of their experiences. That’s why exchanging stories that have been solidified into artifacts can be helpful in established groups. People do this (sometimes without realizing it) by exchanging photos, notes, and letters, often to say things they can’t say (or don’t usually say) in person. Another method groups use to break out of story sharing ruts is the structured story-sharing exercise, often in the form of a party game: tell two lies and one truth about yourself; describe your ideal day; what would you take to a deserted island; what’s an accomplishment nobody knows about; finish this story your way; and so on. My game Narratopia is a structured story-sharing exercise, and I designed it mainly for people who already know each other. People have told me that they played Narratopia with people they’ve known for decades and found out things they never knew about them. That’s part of what the game is for, exploring further. But my hope has also been that playing Narratopia will have an impact on the unstructured story sharing that takes place in established groups, that the structure of the game will bleed in to everyday talk (as it should, since it’s based on what we know about story sharing in everyday talk). If you are part of an established group, and you want to solve problems, work towards goals, spark insights, or renew relationships, you are likely to lean toward unstructured story sharing because it’s familiar; but an occasional exercise or artifact will probably do you some good. If you go to a team-building session, or a marriage retreat, or a family camping trip, or a kickoff meeting for a new project, one of these other ways of sharing stories is likely to help you supplement and strengthen your story sharing. In this middle-ground situation, where the distance between people is significant but not overwhelming, just getting people together for conversation in an open, inviting environment can work wonders. This is where I’ve seen conversational story sharing work better than any other method. You can see this benefit at conferences, especially in the open spaces between structured activities. The best conferences, in my experience, respect this need and allocate plenty of time for informal conversation. 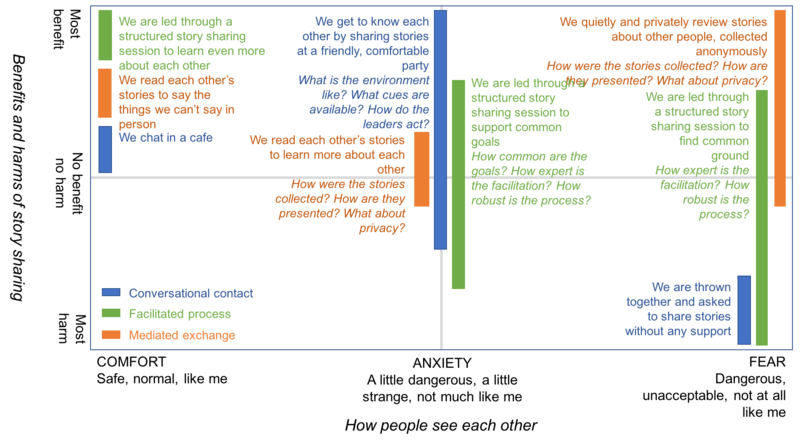 In the middle space, unstructured conversation (my blue bar on the diagram) has a high variance (height) on my vertical scale of benefit and harm because the way conversational story sharing plays out depends on the environment in which people share stories. I’ve seen situations where stories flowed for hours and people came away feeling that they had made new friends. I’ve seen situations where stories bloodied the ground and people came away feeling bruised and wary. There’s a lot you can get right and wrong when you set up an opportunity for people to share stories. If I wanted to get people in this middle place to benefit from conversational story sharing, I would pay attention to these things. Time. When I’ve talked to people about allocating time in meeting or conference schedules for story sharing, I’ve noticed that people always want to allocate less time than I think is necessary. My guess is that people don’t realize that story sharing needs time to ramp up. Usually the real story sharing, the useful cooperative exploration, happens in the last portion of the time. At the start, story sharing is always about assessment: What can I say here? How will it be judged? How will it be passed on? Will it be twisted, derided, used for purposes I don’t like? Or will it be respected, appreciated, used to learn together? People don’t just need enough time to share stories. They need enough time to work their way toward the stories they want to share. If you are allocating time for conversational story sharing among people who don’t know each other well, you will probably need to double or triple the time you thought you would need. Space. To share stories, people need to be able to form, dissolve, and reform small groups. Chairs (and maybe tables) must be movable, and there must be enough empty space to create distances between groups. Sound. To share stories, people need to be heard by few but not by many. Cover for quiet conversation in small groups is key; quiet instrumental music is a good choice (unless hearing impairment is an issue). Cues. The cues in any environment in which you want people to share stories must communicate the opportunity for relaxed, respectful, quiet, casual conversation. Beware of contradicting cues people might get from features like a stage or a microphone, which give people the signal to perform well or to be a good student or judge or audience member. Two cues that are particularly useful to signal a context for story sharing are centers and activities. Centers. People are more likely to share stories if they can congregate around things that help them form inward-looking circles. If you have a small group, you can use one congregating thing, like a campfire. For a larger group, you can find a few things people can gather around, like food (maybe a few food spots), things to look at (coffee table books, sculptures, windows), comfy chairs in circles, and so on. That’s why hotel lobbies have all those little clutches of chairs: because people need places to be alone together. Activities. People are more likely to share stories if they can do something with their hands while they’re talking. You can support this by setting up localized physical activities such as roasting marshmallows, rearranging blocks or cards, doodling on paper, or looking through photographs. A long time ago, people shared stories while taking care of their daily chores, and it still feels natural to do something with our hands while we are sharing stories. Plus, keeping hands busy keeps eyes busy, and this helps reluctant people speak up without feeling like everyone’s eyes are focused on them. Contact. To share stories, people must feel free to vote with their feet — to join and leave any groups they like whenever they want to. It should be easy to approach a group, and it should be easy to leave a group. You can facilitate this by making the barriers between groups small. For example, people shouldn’t have to choose a group and stay in it for the entire time. You can come right out and say this, or you can imply it by the way the space is arranged. Modeling. In every social grouping, somebody sets the tenor of the conversation, and people coming into the space notice it and respond. You can do this as the host of a get-together, by the way you welcome people into the space and mingle with the various groups in the room. Sometimes it’s useful to have a “core group” of people who know what the session is for beforehand and get things started by deliberately modeling the kind of quiet, respectful story sharing you want to take place. Any of these factors can transport or derail story sharing in a social gathering. Note that I place some of this blue bar into the space of harm, because conversational story sharing in the middle space can move into performance, judgment, and even attack if it goes badly. They knew the people. They did their homework before the session, and they had a good understanding of the needs and hopes and fears and comfort zones of each group of people involved. They chose an exercise that would work for all of the groups, and they tested their ideas in advance. They were ready to adapt. They knew how to shape the exercise they had chosen to the circumstances they found as the people came together. They knew how to introduce the exercise, how to get it moving, and how to fix problems when they arose. They had a Plan B ready, and they could put together a Plan C in a minute. They managed their own expectations. As any teacher knows, it’s easy to develop ambitions that run out ahead of what the people you are trying to help can actually do. The people I have seen succeed in bringing people together through story sharing have had a strong sense of humility and patience. Story work doesn’t come with a lot of control, and that can be hard to get used to. You can work your hardest to bring people together, and you can fail through no fault of your own. On the other hand, it is sometimes hard to say whether such an effort has failed, because its repercussions can echo far into the future. As long as anyone remembers what happened and can reflect back on it, there is a chance that what seemed like a failure will turn around and surprise you with a positive result. That’s one of the things that makes story work so frustrating and so fascinating. Okay, so that’s the blue and green bars in the middle anxiety area. What about the small orange bar of mediated story exchange? This is the safest bet for people in the middle distance, in the sense that there is not a lot of variation in what happens. But it’s not usually transformative. People in this area can learn some things about each other from encountering solidified stories, but they don’t get what they need most in this space, which is the iterative negotiation of truths. For that you really need to converse. The last situation I want to consider is the most ambitious: when you want to help groups of people approach each other from a very great distance. In this situation, people have little or no direct knowledge about or experience with people from the other group. Their images of those people are caricatures pieced together from fragments gathered from the news, from hearsay, and from fiction. The word “caricature” comes from the Latin carricare, meaning to load a wagon or cart. So a caricature is an image loaded, or heaped, with beliefs and assumptions about other people. In our images of the people we fear, as in a caricature, some elements are grotesquely exaggerated, while others are reduced or removed entirely. Thinking about caricatures makes me think of teeth and claws. I’ve just been reading a fascinating book by Paul A. Trout called Deadly Powers: Animal Predators and the Mythic Imagination. (Thanks to our member Murray McGregor for pointing me to it.) The book describes how early storytelling and the development of myths were influenced by the abundant, huge predators that actively hunted humans until fairly recently in our evolutionary history (and are still important in some parts of the world). As Trout recounts, as infants we still respond to visual cues that signify, in greatly simplified form, the shapes or movements of predators most of us have long since stopped fearing at a conscious level. In our modern age, we retain an evolutionary legacy that influences everything with think and feel, and we are largely unaware of its influence on us. The same legacy influences how we respond to other people. The simplified caricatures we make of people we fear are not that different from the simplified sets of features we recognize in dangerous animals. Our implicit bias towards people who seem foreign to us influences our thoughts and feelings at a level beneath our awareness. The problem has to do with time and how much we have of it. When we have the time to observe and reflect, we can make nuanced distinctions as we carefully observe our situation. When we have no time, nuanced distinctions can kill us. The result is that in crisis situations, today as ever, we fall back onto simple heuristics to survive. Research has shown that implicit bias can be overcome — that is, our simple heuristics can be updated and improved — but not in the heat of the moment; only when there is time to observe and reflect. This is as true in story sharing as it is in any other part of life. Fleeing. The first thing that usually comes to mind in situations of danger is the most obvious: running away. When people run away from story sharing, they can do it physically, cognitively, or emotionally. Physical flight is obvious: people leave the room, or hug the wall, or sit near a door, or linger near the coffee, or they just hang back and preserve a greater physical distance from the activity than others. I’ve seen many a wary participant do this, and I’ve learned to leave them alone. Chasing them only makes them run further away. People who are doing this usually won’t tell any stories at all. They might make a joke as they head out of the room or back to the coffee machine, but that’s all you will usually get out of them. Cognitive flight usually takes the form of a suddenly important task. People find that they have a text message or email they must read right now; or they become consumed with curiosity about something unrelated to what is going on; or they “go meta” and examine a minute detail of the proceedings. I remember a person in a workshop once who was consumed with an intense and sudden need to discuss the theory behind the story sharing approach. These are all ways to avoid getting involved in story sharing. When people who are in cognitive flight tell a story, it’s rushed and incomplete. It’s really more of a reference to a story they might have told in a safer situation than an actual story. Such a story is not meant to provide cover; it’s a quick feint at storytelling so they can make a mental break for the exit. Emotional flight can be seen in the form of a retreat from feelings to facts. I’ve seen this reaction a lot among professionals. People in emotional flight don’t get busy, and they do attend to what is happening, but while they are talking, they wall themselves off in a world that is devoid of emotion. When someone else tells a story, instead of responding with a story of their own, they start listing facts or giving lectures on subjects nobody asked about. They may talk more than anyone else in the group. But afterward, no one will have learned anything about them — not about their true selves; not about anything you couldn’t read in an encyclopedia. Freezing. Another strategy in the face of danger is to play dead, to become small and inconspicuous, to lie close to the ground, to roll into a ball, to withdraw from the situation without fleeing from it. I’ve seen people do the same thing in story sharing groups. They don’t run away, but they try to become invisible. They look down at the ground; they go silent; they refuse to react; they don’t make eye contact; they have “wooden” or “lifeless” responses to the things other people say. If they do tell a story, the purpose of the story is to deflect attention from them. It’s usually a story about the community or the organization as a whole, or a story about someone they barely know, or a story that isn’t really a story, just a bland statement of well-known and uncontested fact. It’s a cover story, a story meant to provide cover, so they can hide, like a fawn in the grass or a turtle in its shell, until the danger is past. A cover story may be long and lively, and it may adhere to group expectations about what constitutes a “good” story; but it will be a camouflage story, empty of any revelations about the storyteller. Fighting. When people decide to fight in a story sharing context, they fight with stories. This can mean either of two things. Fighting stories. Say I’m in a group, and I’m afraid, and you’ve just told a story I don’t like. I might fight your story by making sniping comments about it or asking cutting or sarcastic questions about it. I might claim that you’re lying, or you’re biased, or you’re being unfair, or you’re leaving information out, or you’re distorting what happened. I might say that you had nefarious motives in your choice of a story to tell — that you told this particular story at this particular time and in this particular way in order to attack me or a group unjustly. In short, people attack stories as though they were beasts. But like prehistoric people facing giant carnivores, no one person can kill a story on their own. Its existence, its life force, depends on its acceptance and retention by the group. So only the group can kill it. To fight a story successfully, we must rally the group to our defense, and so it is to the group that we speak, even when we seem to be addressing the storyteller directly. Fighting stories with stories. When you look up advice on how to interact with predators in the wild, you’ll read that sometimes it’s best to play dead; and sometimes it’s better to roar back at predators, to work on sounding louder, looking bigger and stronger, and finding ways to intimidate those who intimidate you. When people are sharing stories and hear a story that frightens them — or sometimes even when they imagine a story they might hear — they tell stories that make them appear larger and scarier than they really are. Stories told by the fearful to intimidate the dangerous are easy to spot: just look for exaggeration. Everything in these stories is larger than life. The numbers are big; the challenges are insurmountable; the accomplishments are amazing; the villains are monstrous. These are all signs of fear, and they are signs you should pay attention to if you want to help people share stories. There is also a subcategory of stories told to belittle other stories (or other tellers of stories). These are less common simply because they’re more complex, and most people aren’t thinking that far ahead in a crisis (though there are exceptions; some people seem to carry a stock of belittling stories ready for use in a crisis). Massing. Another survival strategy in the face of fear is to form a herd. 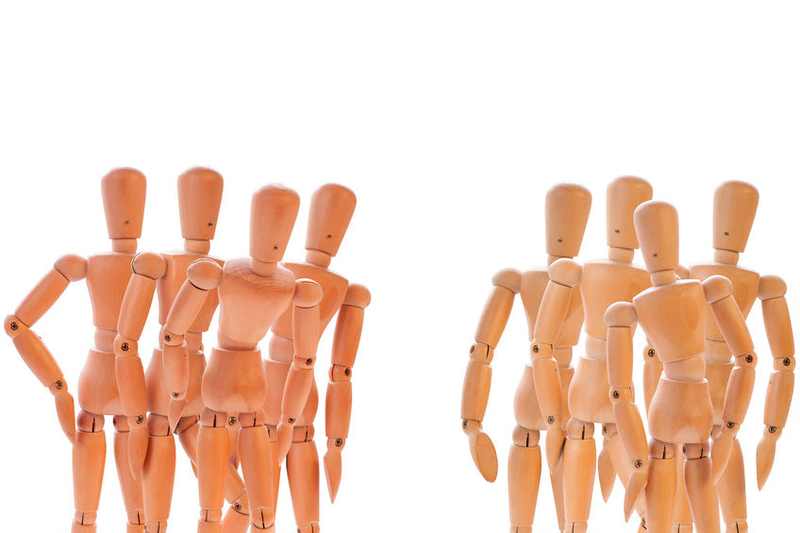 In every species that forms packs or herds, every member of the herd has less to fear than they do when standing alone. That’s why massing behavior has evolved in so many species, including our own. Herd formation in story sharing looks like intense, even obsessive attention to points of connection. People who are massing tell a lot of stories, and they choose their stories carefully so that they stand together in a united front against whatever seems to be threatening them. In this state, people go to great lengths to connect their stories strongly together, discovering connections that might otherwise be weak and strengthening them by probing the details of the stories. In a sense, people who do this are trying to create a group story that is stronger than any one person’s story can be alone. Sometimes you’ll see people mass together by coming up with a theme or a motto for the group. They’ll say things like, “It looks like we are all talking about resilience, and how we keep picking ourselves up again after a loss.” This may indeed be a thread that runs through the stories, and finding such a thread can be a sign of working well together. However, when the energy people put into finding such threads seems desperate rather than curious, it’s usually a sign that people feel threatened by someone or some element in the group. Mobbing. In animals, mobbing behavior takes place when several unrelated individuals, often of different species, come together in a sort of flash vigilante mob to attack and drive off a predator. Mobbing is similar to massing, but it’s aggressive rather than defensive. In story sharing, mobbing tends to surface as group attacks on stories and storytellers rather than the coordinated telling of stories. People who want to mob a story or storyteller try to mobilize others by speaking to the audience (with the equivalent of alarm calls) as the story is being told. Think of protestors who, during a contentious speech, hector the speaker or try to start a chant that will silence them. Their audience isn’t the speaker; it’s the crowd. Mobbing during story sharing often takes subtle forms that interfere with the storyteller’s permission to hold the floor. People will turn away from someone who is telling a story they don’t like, or they’ll fidget, or they’ll whisper some bit of information to their neighbor, or they’ll suddenly need more coffee (and offer to get some for everyone). Or they’ll laugh at something in the story that wasn’t supposed to be funny, or sigh at something that was. Or they’ll throw in a quick “Yeah, right” or “Ha!” or “Come on.” Mobbing during storytelling tends to start small and grow until it reaches a critical mass or dies off. I’ve seen such mobbing behaviors rise to the point where it’s clear to everyone that the storyteller is going to have to change their story or stop telling it. Distracting. Deep in the ocean, tiny shrimp create spasms of bright light that confuse and disorient predators while they make a mad dash for life. The wings of some insects and birds similarly show bright colors only when they fly up to escape predation. These strategies are meant to give prey animals a few precious milliseconds to rush away from the situation. You can see fearful people doing the same thing in story sharing situations. Whenever you hear people sharing stories, and one person tells a story that veers abruptly off the topic, they may be trying to distract the attention of the group away from a topic that is getting too close for comfort. Excessively animated or loud or funny stories are sometimes told for the same reason. Sometimes a person will seize onto some insignificant detail in a story and use it as an excuse to push the conversation away from an area they find threatening. Say people are talking about abuses of power, and someone tells a story that happens to take place in a car. An uncomfortable participant might seize on that detail and launch into a description of the trials they had getting their first car to start. I’ve seen people bounce all over the place in such a group, with some who are determined to stay on topic (and who might be seen as the predators in this case) aligned against those who are just as determined to avoid the topic (and whose stories get brighter and more distracting the longer the conversation goes on). Appeasing. Placating a predator does not mean lying down and waiting to be eaten. It means finding a way to give the predator what they want without being eaten. Ancient myths often included acts of appeasement: presenting the dragon with one maiden per year; leaving offerings for the spirits of the mountain (which took the form of coyotes); leaving certain gardens or areas of land to the exclusive use of dangerous predators (who might otherwise feel the need to get their food directly from the village). When people are sharing stories, you can see appeasement taking place in two ways. Overly enthusiastic appreciation. Have you ever told someone a story and been embarrassed by their weirdly over-the-top praise for your “heart” or “generosity of spirit” or “willingness to share your unique perspective”? That’s usually a sign that your audience felt threatened by you or by your story. (Okay, some people actually talk that way, but for most of us it’s a sign.) When you hear a lot of people in a group praising each other’s stories to the skies, they could be happy, but they could also be scared out of their wits and hoping not to be attacked. The key is to find out whether people can give a reason for their praise. If they say a story was “wonderful,” say, “Why do you think you liked that story? How did it resonate for you?” If the people can’t say why they liked a story, their praise for it might be a defensive reaction. Self-effacing stories. Another way people appease dangerous predators while sharing stories is to tell stories specifically designed to make themselves look non-threatening. The message in a self-effacing story is “I’m harmless, so you don’t need to attack me.” When people are doing this, they tend to over-share, because they’re worried that their message will miss its mark. They’ll tell story after story about things that seem meaningless but in fact have a specific point, which is that they are not worth attacking. They’ll talk about how they forgot their keys last week, or how they are hopeless when it comes to arithmetic, or what happened when they tried to open a can of peas and couldn’t work the can opener. I’ve seen a lot of women do this, in particular, in work settings, and it makes me cringe. Sometimes you’ll see a group interaction where the first half of the time is used up in people putting themselves down. If everyone does it, people sometimes calm down after a while and start actually sharing their experiences. But if anyone takes on the role of the predator, for example reacting with criticism or (worse) advice instead of assurances that “oh, that’s okay, everyone forgets,” the fear in the group will mount, and no real story sharing will take place. All right, so now we’ve worked our way through seven types of survival strategies people use when they are placed into a context where stories are being shared and they are afraid of the people in the room. If you look again at the diagram I started this post with, you’ll see that my recommendation for situations in which people fear each other puts the blue bar of unstructured story sharing fully in the space of harm. I hope by now that you can see why. These survival strategies are all things you are likely to see if you throw people who fear each other into an unstructured conversation and simply ask them to share stories. The greatest portion of their mental and emotional energy will go into implementing these survival strategies, and very little will be left to explore experiences together. You may be curious at this point about what story sharing looks like when people are not fearful. When story sharing is working well, you should see these things happening. Curiosity. When people feel comfortable sharing stories, they use their stories to explore topics. One story leads to another, and the chains of stories people create help them all make sense of whatever they are talking about. If they’re talking about cats, they all come away from the exchange a little more informed about cats. Or cancer. Or construction. Or Catholicism. When story sharing works, it helps people think together. When story sharing is defensive, however, people come away from the interaction having learned nothing (except to avoid situations like that in the future). Connection. When people feel comfortable sharing stories, they discover connections between their lives and experiences that they had not anticipated before the conversation started. When story sharing is defensive, stories don’t connect the way they should, and as a result, people don’t connect the way they should. The stories and the people are scattered, desperate, running in all directions, and it’s hard to build connections in a state like that. Purpose. When people feel comfortable sharing stories, they bring whatever they’ve been thinking about lately, in their work or life or both, to the discussion. They find ways to introduce topics they are actively working on, and they try to make progress on them. They ask others to help them make progress. They work together to help everyone in the group find what they are looking for. But when story sharing is defensive, people put aside any goals they might have had for the session and just try to get through it. Enjoyment. When people feel comfortable sharing stories, they have a good time together. They smile and laugh, even when it’s between tears. People love sharing stories with each other, and that’s true even when the stories are sad. It’s one of the ways we connect and build bonds with each other, and when it’s working, it feels good. When story sharing is defensive, it doesn’t feel good; it feels like an ordeal, and people are relieved when it’s over. Tell me about a connection you discovered today. Is there anything you made progress on today? Did you enjoy yourself today? Would you like to do this again sometime? The answers you get will tell you a lot about whether unstructured story sharing was the right choice for the people you brought together. You may be thinking right now that not everyone goes into a panic around people who seem different. That is certainly true. Everybody knows somebody who can walk into any social setting anywhere in the world and feel comfortable talking to any human being. But everybody doesn’t know a lot of people who can do that. If they did, our society would be a different place. People vary in how fearful they are around people who seem unlike them, just as people vary in how much they cringe at the sight of a lion or a bear. It was this variation that helped us transition from a purely prey species to one that developed tools and strategies for social defense and attack. Somebody had to throw the first spear, after all. The bold among us can and do lead us into the places we fear. It’s no coincidence that many people who are socially courageous are also good facilitators. But every good facilitator must also be a good observer, and they must be honest enough with themselves to admit that most people are not willing or able to stride into battle alongside them. A leader who walks too far out in front of their people finds themselves leading no one. Okay, so let’s pretend that you agree with me that unstructured story sharing is a bad idea when people are afraid of each other. What about facilitated process? As you can see in my diagram (which is based on my experiences trying to do these things), the outcome of such an attempt can vary from reasonably positive to disastrous. It depends on the skill of the facilitator and the robustness of the process. I have seen some amazing facilitators work wonders with groups who might otherwise have been at each other’s throats. Some people have exceptional skill at observing the way other people are behaving, predicting what might happen next, and heading off problems just as they are emerging. The best of these people mediate in emergency situations, such as when people are taken hostage or buried beneath rubble. Remember when I said, above, that people who help other people come together have special skills at knowing people, being ready to adapt, and managing their own expectations? The same thing holds true here, but times ten. If I was planning to bring people together in a structured conversation, and I knew that the people had a strong fear of each other, I would not choose this option unless I was very sure that my skills and experience, and the process we were going to use, were up to the task. Finally I have arrived at the last colored box on my diagram: the orange box that denotes the use of collected stories to mediate between people who fear each other without bringing them into direct contact. As you can see, I think this method works better than any other when fear is strong. This is not to say that you can’t ever use the other two methods; but if you have a choice, you should use this method first, then see if you can move on to a closer approach between the groups. So let’s say you want to bring two groups of people who fear each other into indirect contact through their stories. How should you do it? What works best? Here’s a strategy that works for me (or I’ve watched too much Star Trek). Pretend you have met an alien on an alien planet. Pretend the two of you speak different languages. Maybe they make little clicking noises, and you can’t be sure which part of them is their face. Do what people always do when they want to communicate to strange people that they mean no harm. Show your hands. Be transparent about your intentions. Don’t lie. Don’t try to jolly people along with cajoling, manipulative “wouldn’t you like to” language. Just tell people what you are trying to do and why. Let them handle your tools. Be transparent about your methods. Tell people how you will collect stories, what you will do with them, how they will be stored, how they will be displayed, and who will see them. Don’t hide your process. Give people as much information as they want about it. Listen attentively. Keep the stories you collect raw and unimproved. Tell the stories in the voices of the people who told them as they told them. Make sure everyone knows that every story in the collection was told by a real person and is unchanged. Speak calmly. You might feel passionate about bringing people together; you might feel that society is in crisis; you might feel that what you are doing is absolutely critical. That’s great! Just don’t get too excited about it in front of people. You will only scare them off. Don’t try to frighten people into joining your effort by raising alarms. Place your emphasis on positive, calming things, on hope, on the future. Speak with respect. The word namaste, which means “the divine light in me sees the divine light in you,” is a perfect example of what you must do when you want to bring people who fear each other together through their stories. No matter who you are looking at, see them for who they are: human beings. You want to bring the people in two or more groups into a state of namaste, right? You won’t be able to bring them there until you can see the humanity in both groups yourself. Don’t corner people. Another thing we fear from predators, especially those that move in packs, is being trapped by them. So don’t trap people. Give them a way out of the interaction, in both directions: in the direction of less engagement, and in the direction of more. For example, you can invite people who tell stories to engage with the body of collected stories, and even (later) to engage directly with people in a structured story sharing exercise; but you must also make it clear that people can leave the project, or drop back to a lesser level of engagement, at any time. Break bread together. Find things you can be sure that people in both groups have in common, and draw attention to those things. There’s a reason people all over the world offer food and drink to visitors: it’s universal. Nobody doesn’t eat. Also, my willingness to eat your weird food, just this once, shows my willingness to consider your point of view. When you facilitate story sharing, you can break the bread of universal human experience together — in the way you talk to people, in the stories you ask them to share, in the stories you show them that other people have told. After some commonality has been established, you can start to explore differences; but at first contact, it is best to draw everyone’s attention to the things we all have in common. Watch for signs of distress. In animal behavior, an intention movement is a deliberate communication of distress, a message that something needs to change or things are going to get worse. Animals use intention movements to ward off potentially life-threatening conflicts. You can see dogs and cats do this when they bark or growl or hiss or snap at the air. They are not showing aggression as much as they are trying to avoid conflict. The most dangerous animal is the one that makes no intention movements and seems content until the moment they attack. When you are approaching people to ask them to participate in a mediated story exchange, you can be alert to such signs. The defense strategies I mentioned above are all things you can notice when you ask people to share stories with you, whether it’s in a synchronous group, a chat session, an interview, or an online form. When you see people freezing or fleeing or fighting, you can back off, give them some space and time to observe and reflect, and then see if you can respectfully approach them again. If you see a lot of people reacting defensively, you might need to slow way down and rethink your entire approach. I’ve now covered all of the colored boxes on my diagram. I did notice at some point that there is a sort of time sequence that works best in each situation. On the left, when people know each other well, it works best to start out with unstructured conversation, move into artifact creation, and then use the artifacts to support structured story sharing. In the middle distance, you’ll get the most benefit from cycling between the three modes in an iterative process. On the right, when people fear each other, it is best to start with mediated story sharing, and then, as people take baby steps toward each other, see if the time is right for a facilitated, structured, limited interaction. Ideally, as people get to know each other better, they will shift over to the middle space, where iterative cycling among modes can be brought into practice. As usual, I have no idea what to do with any of this; it just rose up to meet me, and I’ve been playing with it. We’ll continue to play with these ideas (and others) in our call. I invite you to play with these ideas as well, and to join in the discussion.